To be disciples...to make disciples. The history of the First Presbyterian Church, Corinth, began with the settling of the village at the intersection of the Mobile and Ohio and the Memphis and Charleston Railroads. 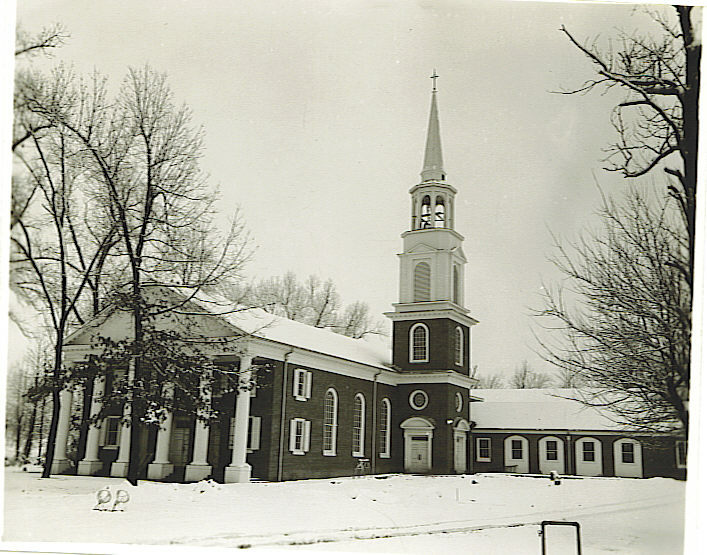 Before Corinth was three years old, two separate Presbyterian Churches were formed. The Cumberland Presbyterian Church was founded in 1857, and a building was erected on Cruise Street just east of Madison Street. The First Presbyterian Church, founded in 1858, first had a building on southwest corner of Franklin and Linden Streets. Most records of both congregations were lost during the Civil War, but each church reorganized as soon as possible following the war. The Cumberland Church sold their building to the City of Corinth for a public school and built a new building on Fillmore Street (See right pictures) and changed its name to “Fillmore Street Presbyterian Church.” In 1894 First Church built a modern church building on the northeast corner of Franklin and Foote Streets(see left picture), which was occupied by that fellowship for about sixty-five years. The membership of First Presbyterian continued to grow, and the building near the courthouse was in need of major repairs. 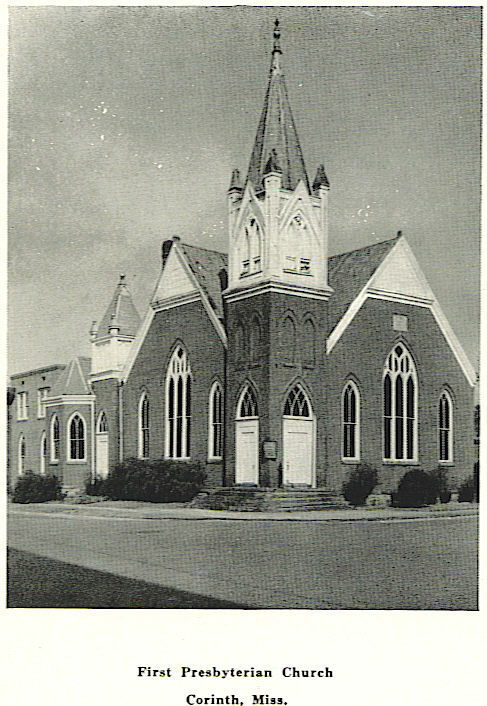 In 1949 the church purchased, for $11,500, land on Shiloh Road for a future building. Through the years the two Presbyterian churches of Corinth had worked in harmony, sharing summer services, revivals, Bible Schools, and local missions. In 1950 a proposal was made to unite the two churches. However, the presbytery of the Presbyterian Church, United States of America under which the Fillmore Street church operated, refused the merger. Nevertheless, about three-fourths of the membership of that church moved their letters to First Presbyterian Church in 1951. The beautiful little church on Fillmore Street continued to lose members until it was finally dissolved and the property was sold to the First United Methodist Church in 1976. Immediately following the merger of the two church bodies, Dr. Bernard Munger was called as pastor for First Presbyterian, and a monumental building program was undertaken. In 1952 the education building and fellowship hall were completed. The entire $60,000 was paid in a few short years, and the sanctuary portion of the building was completed in 1957, costing $170,000. In 1996 the education wing was enlarged to accommodate more classrooms to be used by both the Sunday School and the day school. The picture to the left shows Niles Helms, Ed Byrnes, and Mrs. Roy L. Young breaking ground on the sanctuary, March 17, 1957. They had each been a member of the congregation for more than 60 years. Following eighteen months of prayer and discernment, the congregation of First Presbyterian voted overwhelmingly in favor of dissolving our association with the Presbyterian Church, USA, on December 23, 2007. In February 2008 the Presbytery of St. Andrew (PCUSA) dismissed us with our property to the Evangelical Church of America. While this is only the history of the physical buildings of our church, other areas of our web page will give more insight into the programs and missions that are the heart of the church. As we honor our past, celebrate our present, and plan our future, we at First Presbyterian Church, Corinth, give thanks to our Lord and ask His continued guidance in serving Him through our presence here.